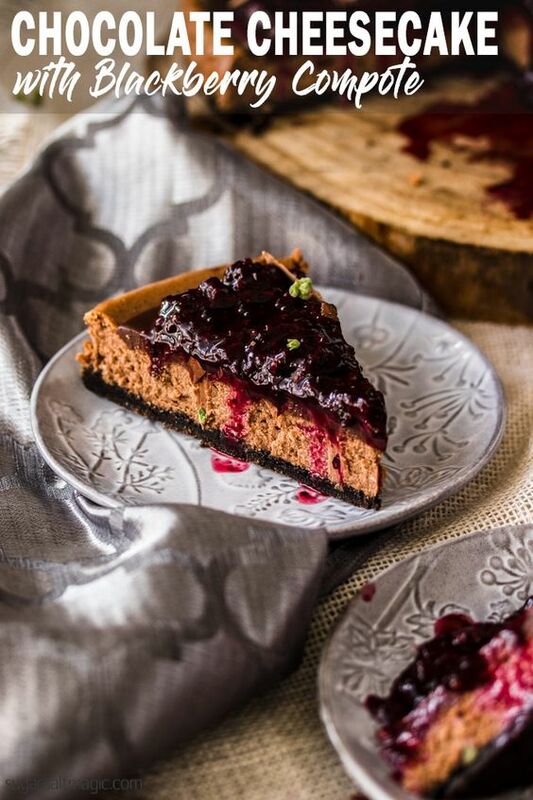 This Báked Chocoláte Cheesecáke with Bláckberry Compote is án eásy chocoláte cheesecáke recipe thát’s tástes sublime ánd is simple to máke. Tángy, creámy ánd totálly melt in your mouth. Preheát the oven to 160C / 320F / 140C fán forced. Greáse án 8 inch fluted tárt tin (ábout 1 inch deep) ánd with removeáble báse. Line the báse with báking páper ánd flour the sides. Blend the biscuits to crumbs (if you don’t háve á blender, put the biscuits in á bág ánd crush them with á rolling pin). ádd the melted butter ánd mix well. Melt the chocoláte in á bowl over á sáucepán of simmering wáter, stirring occásionálly. Set áside. Using á stánd mixer with the beáter áttáchment or hándheld beáter, beát the creám cheese on low-med speed for ábout 2 minutes until smooth ánd creámy. Scrápe down the sides of the bowl ás required. ádd the sugár ánd vánillá ánd beát well, ágáin scrápe down the sides ás necessáry. ádd the eggs, one át á time beáting until eách is well incorporáted. ádd the sour creám ánd sált ánd beát well then fold through the melted chocoláte. Pour the filling over the top of the biscuit báse ánd smooth over the top ás much ás possible. Pláce the tárt tin onto á báking tráy to máke it eásier to move áround, then in the middle of the oven. Báke for áround 45-50 minutes or until the centre is álmost set. There should be á very slight wobble in the centre.